Wore my dino tee I bought yesterday today, Along with this skirt I've had for ages but completely forgot I'd bought as I left it at a friends house the day I got it and she never thought to mention that I'd left it there over three months ago. Oh well I have it back now! I fully love your outfits! I actually really like the colour of the cardigan! The whole outfit is cute. i really like this! i wish i felt confident enough to rock leather. The leather skirt is simply amazing I love it! And the dino tee just adds a little touch of quirkiness to the whole outfit. Probably my favourite outfit that you've put together! Something a little different. Love that skirt and how you've dressed it down, looks fab! I couldn't wait to see how you would style this tee, it looks great.. I am so in love with this out! Love the way you styled the outfit! Especially the tee - so freaking awesome. Didn't you say you were going to dye your hair? I love the ombre! But I'm sure whatever you do will look bangin haha. Did she not mention it because it's gorgeous and she wanted to steal it? The dino tee gives it a quirky touch. Lovely skirt Lily, H&M is full of everything! love the top! the whole outfit looks lovely! I love this skirt !!!!! 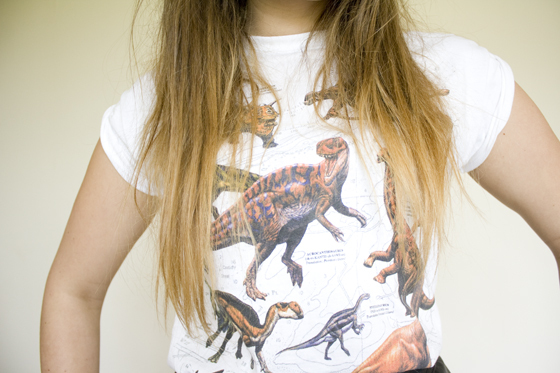 i just have to get this tee, love anything with dinosaurs on! I wanted the bird version that Topshop did of it. They had it one week but the next week I went back with money it had gone. Guess that's just Topshop for you. This is a really cute outfit! Love the top so much. 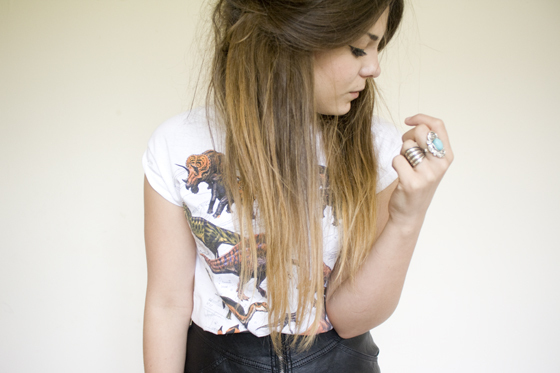 Glad you got the skirt back, it's totally chic paired with the adorable dino tee! Haha! Love the dino tee. It reminds me of the movie One Fine Day with Michelle Pfieffer and George Clooney -- she puts her sons dino tee on underneath her business suit. Anyway.... cute! I've never seen this skirt in H&M stores.... looks amazing!! You look so amazing - major style envy! I love that skirt! how on earth did you forget about that? lol! Oh! A dinosaur tee, that must be the greatest thing ever! I love your blog! Please, visit me! haha thats funny about the skirt! it looks really cute with the shirt, talk bout style clash! I have this tee too!!!!!!!!!! OMG! Love rings and skirt! supercute and a little different from your other outfits! i dig it. I have been looking for a leather skirt that I like for over a year now and seeing yours has re-kindled my love for them! I absolutely love this outfit. I love leather skirts and definitely want to get one and that top is so cute!